Today we are in Corinth where St. Paul lived for 18 months. Every time I come here with my groups I give one of my favorite short talks on the truth of Scripture and the Catholic Faith. You can watch my 10-minute talk below. 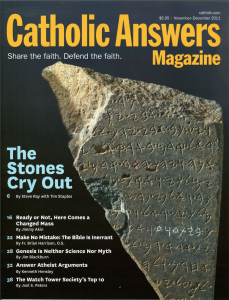 Recently I did an interview I did with Tim Staples which you can read now entitled “The Stones Cry Out: the Apologetics of Archaeology.” It was published in the Catholic Answers Magazine. It especially mentions the stone I am showing my group here in Corinth. Are we sure the Bible is true? Does archaeology help us know? Enjoy! My impassioned talk at Corinth about the Erastus Stone and the truth of the Bible is below.